Compared to countries like Japan, and most of Europe, the US is decidedly trailing when it comes to vending machine technology. 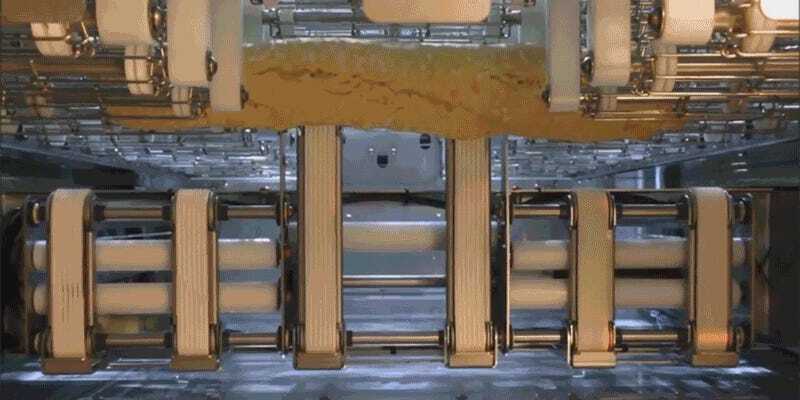 But thanks to a machine called the Le Bread Xpress, hungry Americans who are pressed for time can now grab a freshly baked baguette from a machine in less than 20 seconds. The machines are now available for use in select locations in San Francisco, and actually contain a miniature bakery inside—or at least the oven portion. Each Le Bread Xpress vending machine can be restocked with up to 120 baguettes every morning, which arrive from an offsite bakery where they’re partially pre-baked to speed up the vending process. When a baguette is ordered, the bread passes through a high temperature oven to finish the baking process, before it’s dropped into a chute where the customer can grab it. Up to eight baguettes can be baked at the same time, so customers don’t have to wait 20 seconds for every one they order, and at $4.25 you’re definitely paying a premium for convenience and speed. But what’s a better mid-afternoon snack than a refreshing bottle of pop, a candy bar, and a piping hot fresh loaf of bread?